Sile (pronounced She-LAH) Singleton is a native of Zanesville, Ohio and is proud to be from ‘Y-bridge river country.’ Sile is fascinated by the intersections of ‘isms’ and how it informs/instructs positive perceptions of “faith” and gender in our daily lives. For the past 30 years Sile has spent the majority of her performance time host emceeing various community events around Columbus, the US and Canada. She is an accomplished gender performer best known for her gender bending portrayals of the sassy Lustivious Dela Virgion and the savvy Luster Dela V.
She is the co-founder and visionary of 1990’s nationally and internationally acclaimed drag king troupe, H.I.S. KINGS and IDKE (The International Drag King Extravaganza). 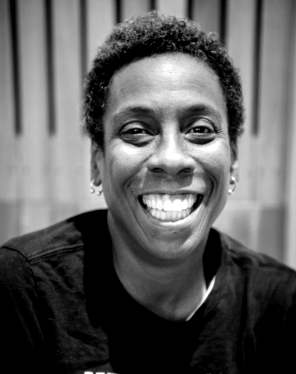 Ms. Singleton is featured in several documentary films; most notable Discovery Health’s "Drag Kings on Tour" (Atlantis 2004) and 2016's break out documentary "Kings, Queens and In-Betweens (Five Sisters Productions, 2016). For 8+ years she toured with her one person play, "PAINT! A Transformative Project" and with a multi-generational production titled "THE LOVE IN(side) Faith & Positive Perceptions of Self"; a show that merges traditional cross-dressing & drag performance with pop, urban & gospel music, spoken word and God’s blessings, in fantastic exploration of cultural blending rarely captured/presented in such an honest and vulnerable way. She is a graduate of The Ohio State University and holds a Master’s and Bachelor’s of Arts degree in Women’s Studies. Her emphasis was mass popular culture and critical race theory. She is a former coordinator of Gay, Lesbian, Bisexual and Transgender Student Services and director of Ethnic Student Services at OSU, as well a 12 year veteran coordinator of Pride Family and Teen Area for Stonewall Columbus’ yearly Pride Festival.